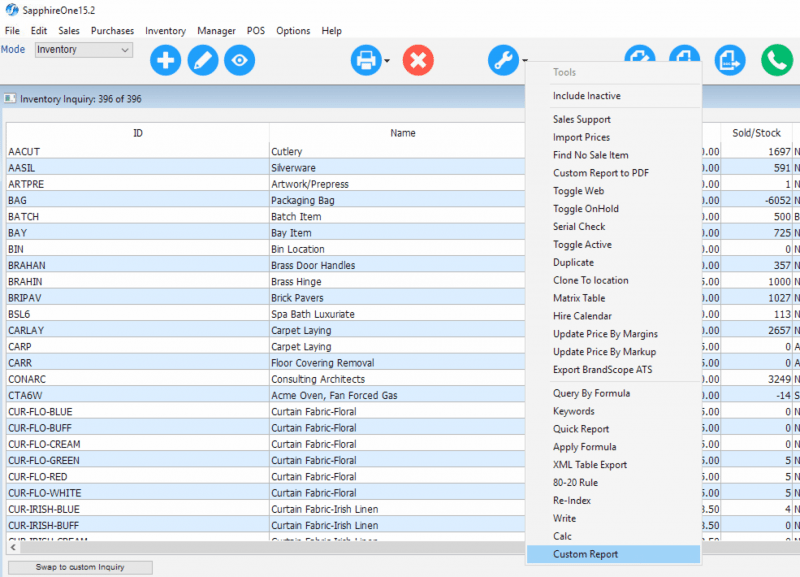 There are various tools in SapphireOne ERP Enterprise business Accounting software. Tools are useful for custom management of accounting system and fine tuning. The Sapphire Tools menu is located on the main toolbar. To display the Tools function one tool menu from an Inventory Inquiry is illustrated in the picture here. While the items listed on the tools menu will alter depending on the function being used at the time, the procedure to access Sapphire Tools is the same each time. The menu to the right is the Sapphire Tools drop-down menu. This may be selected by using the arrow on the right of the icon. There are three methods of selecting Sapphire Tools: the Tools menu, keyboard shortcuts or via the Options menu. Select the Sapphire Tools icon, as seen in the picture, from the main toolbar to access extra functions which allow common actions to be completed with ease. Use the shortcut key (Command K) and you will be presented with the pop-up as seen to the left. Go to the Options menu and select Tools from the drop-down menu. The same pop-up menu to the left will then appear. The small down arrow on the right side of the icon must be selected to display the complete list of tools functions.